Swanson was cut by the Texans on Friday, Aaron Wilson of the Houston Chronicle reports. Analysis: Swanson, an undrafted free agent, was signed to Houston as a depth piece following the 2018 NFL Draft. The the 5-foot-9, 209-pound Swanson made a splash in the final preseason game, leading Houston with 69 yards on 16 carries, including a 37-yard touchdown run. 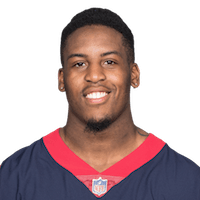 He was always a long shot to make the final roster, but he's a strong candidate to latch on with Houston's practice squad. There are no videos available for Terry Swanson. Click here to view all videos.